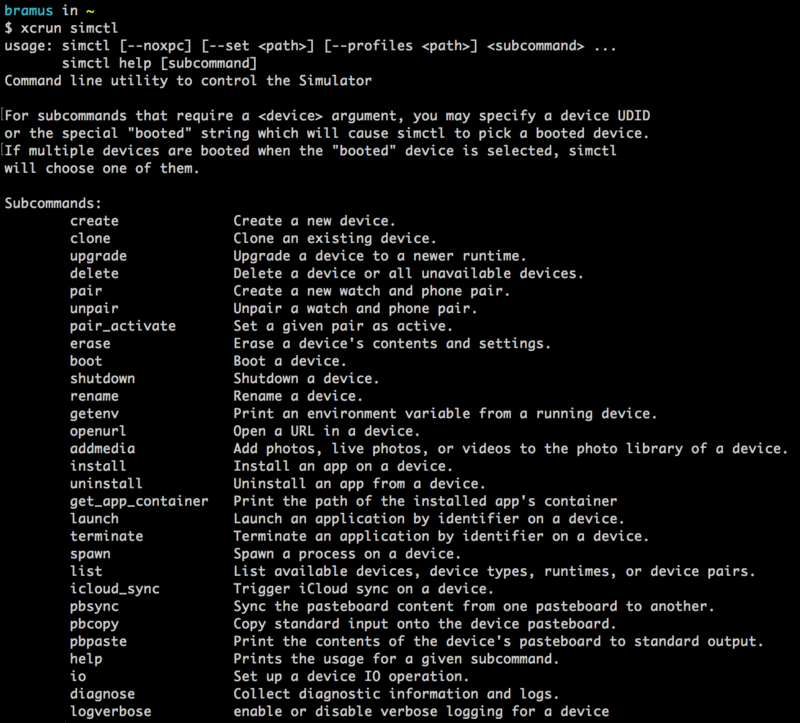 Wasn’t aware of this, but turns out one can control (and interact with) the iOS Simulator straight from the command line. There’s no need to install anything new though. The tool we’re going to be using is already on our Mac, hiding inside the xcrun command, which gets installed with Xcode. xcrun simctl openurl booted "https://littlebitesofcocoa.com"
Other commands include booting/stopping a device, clipboard operations, launching/terminating processes, installing/uninstalling apps, etc. — No touch events though, that would’ve been real fun. Sidenote: digging a bit deeper into this I stumbled upon fbsimctl. Their features are quite the same which makes me wonder if fbsimctl uses simctl underneath its hood, or if simctl came later and copied features from fbsimctl.